Copyright: © 2018 Raaju AL, et al. This is an open access article distributed under the Creative Commons Attribution License, which permits unrestricted use, distribution, and reproduction in any medium, provided the original work is properly cited. A 34-year-old male patient presented with the complaint of chronic pain in the left groin following left side testicular vein ligation for varicocele. Ilio-inguinal neurectomy and cremaster muscle division was done in another hospital for the pain but with no relief of pain. Patient on examination showed point tenderness in the left groin at the pubic tubercle. Finger Invagination test in the left was painful with severe tenderness. Investigation showed fibrosed contracted left distal inguinal ligament. Percutaneous Ultrasonographic (USG) guided inguinal ligament release and Platelet-Rich Plasma (PRP) injection relieved the pain completely. Post-procedure patient showed significant improvement of pain. Groin pain can be of sudden onset (acute), and persist over a long period (chronic), depending on the cause . Groin pain can be as a result of trauma, infection, tumour, hernia, muscle strain, hip pathology, bursitis, fractures, radiating pain from the muscles and tendons of legs. In males, inflammation of testicles and other conditions affecting the scrotum can result in groin pain . Groin pain is also known to occur postoperatively following the inguinal repair surgeries and surgery for varicocele [2,3]. Mild pain lasting for few days following surgery is not uncommon, but moderate/severe pain lasting for more than three months need to be considered and investigated to identify the cause and treat accordingly. We present a 34 years old male patient who came with complaints of pain in the left groin area for the past four years. For secondary infertility, Varicocele ligation on the left was done in 2010. After the procedure, the patient developed groin pain for which ilioinguinal neurectomy and cremaster muscle division was done in another hospital (2015). Pain was persistent and he presented to the Out-Patient Department of our hospital. Examination showed point tenderness in the left groin area at pubic tubercle. Finger invagination test showed severe tenderness in the left side mainly at the pubic tubercle and medial end of the inguinal ligament. MRI of groin with the hip joint was done, which revealed non-visualization of the left medial end of inguinal ligament suggestive of scar tissue/ adhesions. No evidence of hip pathology, muscle inflammation, osteitis pubis noted (Figure 1a,b). Blood serology for inflammatory markers was within normal limits. General surgeon opinion was obtained to rule out a hernia. Clinically no evidence of hernia was found. Under USG guidance local anaesthetic agent was infiltrated over the painful area. Point tenderness improved and finger invagination test was not painful. Figure 1: a): MRI showing Normal right-side inguinal ligament and b): non-visualized left distal inguinal ligament. Under USG guidance percutaneous needle release of the fibrosed ilioinguinal ligament followed by PRP injection in the left groin was done. Post-procedure, the patient pain settled down. Patient was started on inguinal stretching programme along with strengthening of abdominal wall muscles. Patient was followed up for three months and advised to continue Groin Stretching and Anterior abdominal wall muscle strengthening exercises. The Patient had no complaints of pain and can do his daily routine activities without any limitations. The most common cause of groin pain is a muscle, tendon, or ligament strain. Groin pain might occur immediately after an injury or the patient may present with pain of gradual onset over a period of weeks or even months. Causes of groin pain include the following: Osteitis pubis, Inguinal hernia, Adductor tendinitis, Bursitis, Epididymitis, Hydrocele, Avulsion fracture, Varicocele, Sciatica, Retractile testis, Spermatocele, Stress fracture, Swollen lymph nodes, Testicular tension, Orchitis, Urinary tract infection, Ilio-inguinal neuroma, enthesopathy (tennis elbow of groin), Sportsman hernia (tear in inguinal ring), Symphysidysis, Symphysioliitis, Mesh Inguinodynia, hip pathology [2-5]. Groin pain is a recognized complication following groin surgeries like inguinal hernia repair varicocele surgery [3,6,7]. The Anatomy of the Groin region is very complex, Consisting Inguinal Ligament, structures which are passing behind the ligament, the Inguinal Canal which is the oblique passage just above the medial half of the inguinal ligament with its structures passing through the canal and the medial end of the pubic tubercle called the Crest Of the pubis which provides attachment to the muscles like Conjoint tendon, Pyramidalis, Rectus abdominis and the external oblique muscle. The inguinal ligament extends from the anterior superior iliac Crest of Ilium to the Pubic tubercle of the pubic bone. It is formed by the Abdominal External oblique muscle aponeurosis and continues as the Fascia Lata of the thigh. Therefore, the pathology in this complex anatomic region of the groin causes difficulty in identifying the exact cause of pain . In this particular patient, MRI groin and hip joint ruled out osteitis pubis, adductor tendinitis and other causes of groin pain. Clinically patient showed no evidence of an inguinal hernia. 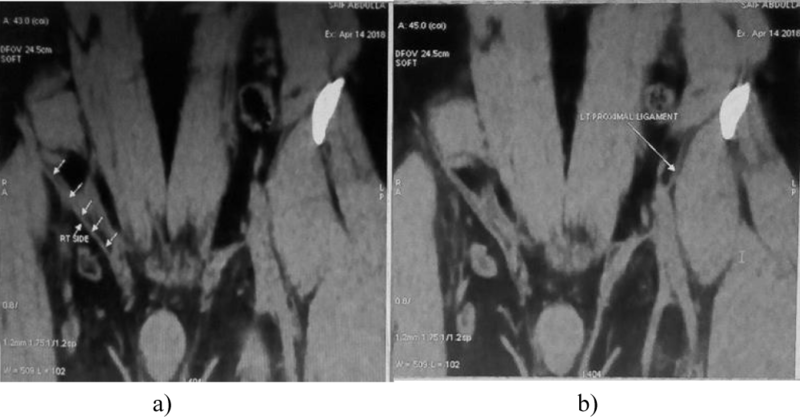 But MRI revealed poor visualization of the ilioinguinal ligament in the left groin probably due to the scar tissue/adhesions involving the ilioinguinal ligament probably because of the previous surgery (Figure 1a,b). Further, the patient on finger invagination test showed severe tenderness in the left side because of the thickened medial side of the ilioinguinal ligament at the site of pubic insertion. Various procedures have been described for the management of groin pain which includes Laparoscopic inguinal ligament tenotomy and mesh reinforcement of the anterior abdominal wall , Open/Laparoscopic mesh removal and ilioinguinal neurectomy and replacement of mesh opposite to the location of the first mesh [6,7,10]. With these surgical procedures, if the pain persists, it is difficult to determine whether the pain is due to the mesh related complications like infection, mesh rejection, mesh migration or because of the initial pain the patient presented with. Also repeated re-explorations should be avoided considering the anaesthetic risks and the Surgical Morbidity. In this patient the fibrosed thickened ilioinguinal ligament was released percutaneously along with Platelet-Rich Plasma injection. Steroid injection was not chosen because MRI didn’t reveal any inflammation and multiple steroid injections can itself cause fibrosis. Considering the presence of various bioactive factors in platelet rich plasma, which favours cellular growth and tissue regeneration Platelet-rich plasma was injected locally . Post-procedure after a follow up of three months period, the patient had no complaints of pain and no difficulty in undergoing his daily routine activities. Therefore, non-invasive management of groin pain should always be preferred first and failure of which surgical/invasive procedures can be considered. This novel, technique of per-cutaneous release of fibrosed inguinal ligament can give good short-term results in chronic groin pain due to fibrosis of inguinal ligament particularly when combined with Bioactive Platelet-Rich Plasma. It can avoid invasive surgery like laparoscopic inguinal ligament release and mesh reinforcement, and its related complications. Limitation of the study is, case report of single patient and short term result (3 months). BD Chaurasia’s Textbook of Human Anatomy. Vol-2, Fifth Edition. 223-226.